On this date in 1930, Yang Kaihui was executed in Changsha, China. The 29-year-old mother of three was beheaded for her refusal to renounce the Chinese Communist Party and Mao Zedong. She was technically Mao’s second wife; a previous marriage had been arranged for Mao by his parents, but he and the woman never lived together and the marriage was never consummated. Yang and Mao grew up together in Changhsa — she was the daughter of one of his teachers — and fell in love as young adults. Yang, like Mao, was an enthusiastic Communist. She joined the CCP in 1921, becoming one of its earliest members. 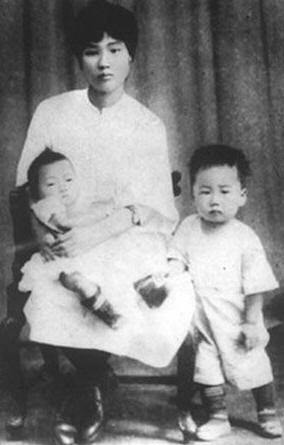 She never held any official position in the CCP, however, and wasn’t terribly active in the movement, since she had to raise the children. But Mao became more and more absorbed in dangerous revolutionary work, and he and Yang were often separated when he traveled. The last time she saw her husband was in 1927, the year the Chinese Civil War started and Mao became a guerrilla leader, hiding in the mountains, far from his family. They maintained sporadic contact after that, but often what little she knew about his activities came from the papers. Yang predicted she might meet with a violent death. She was right: on October 24, 1930, a warlord loyal to the nationalists captured her and one of her sons. She did not break under threats and torture, and refused to give in and publicly repudiate her husband and Communism, even though her captors offered to spare her life if she did so. She became one of the CCP’s earliest martyrs. Yang was executed more for being Mao’s wife than she was for anything she’d done herself. She wasn’t the only woman who would be killed for being married to a prominent member of the CCP; the wife of Zhu De had met with the same fate in 1929. Mao, who had always called Yang his true love, was reportedly devastated by her death and wrote, “the death of Kaihui cannot be redeemed by a hundred deaths of mine!” He wrote a poem about her in 1957 that suggests he still grieved for her even then. But it must be noted that he never tried to rescue her or his sons when he knew their home had turned into a battleground and their lives were in danger. 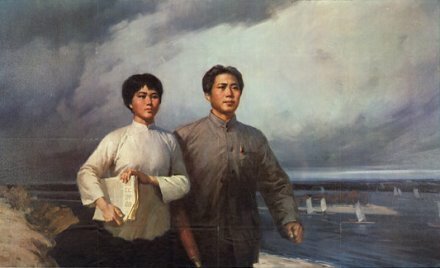 Propaganda poster of Yang and Mao. Tragedy followed the lives of Yang and Mao’s three sons. The youngest boy, Anlong, died of dysentery in Shanghai at the age of four, soon after his mother’s execution. The oldest, Anying, was killed in the Korean War. Middle child Anqing lived to be 83, but perhaps as a consequence of watching his mother being put to death as a youth, he suffered bouts of mental illness throughout his life. He died quietly in China in 2007.